Kurt Browning Website: New URL! New Design! @KurtBrowning This is 4 U! http://youtu.be/UDE0Y76VOUM Thanks 4 25 yrs of friendship today! #HappyAnniversary :) John <3 & "Happiness"
A: in addition to this @jeopardy clue @KurtBrowning & @KenJennings have him in common! 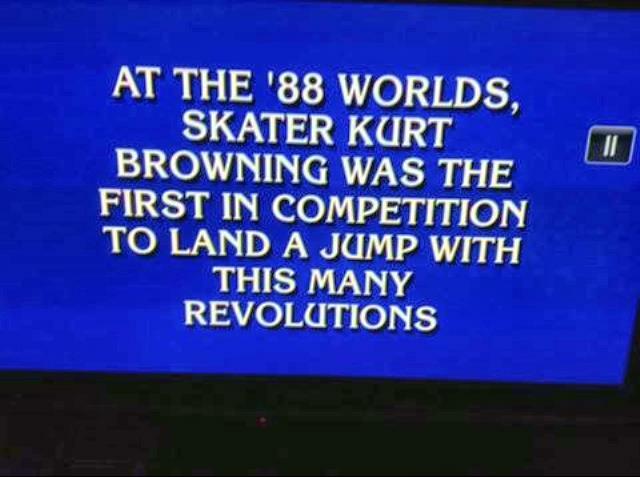 John was actually in the front row at the event to which this real Jeopardy! clue refers (World Championships: Budapest, 1988) Kurt and John me athe following day and have been friends ever since. See http://www.jhbonline.net/kb/id8.html for more! New Stars On Ice 2013! Work in progress! Much more to come! Updates to my Stars On Ice 2013 Pages with STILL MORE TO COME! To me, the most important title Kurt holds is "My Buddy." We met in 1988 at the World Championships in Budapest, Hungary. It was outside the arena. Mom was busy trying to fit my wheelchair into the trunk of the small (understatement) Soviet-made automobile being used to being used to transport us from the hotel to the arena and back. I saw someone running out of the back of the building. It turned out to be Kurt! Because there was no such thing as accessible seating, my wheelchair was put on a platform at rinkside near where Kurt had accomplished his famous "Quad". That was a good thing. He wasn't very famous in those days --especially to an American, like me! I might not have recognized him. Years later I found out others had told him about me. I had been attending competitions since 1981, and had been fortunate enough to be befriended by many skaters. Our dear friend, Rosalynn Sumners has been instrumental in bringing us together.Thanks Roz! We love you!!! With Olympic Silver Medalist, US & World Champion, Rosalynn Sumners. Since then, Kurt & I have formed a lasting and enduring friendship, which has truly changed my life. I have been extremely blessed to experience the incredibly warm and caring personal side of this extraordinary man. Kurt & I may not be as close as were once were, but I hope you'll enjoy reading about our backstage adventures! SOI Vancouver, BC 2003 NEW!!! CLICK HERE New photo added December 5, 2004.